When it comes to men, there are no hard and fast rules. Sometimes online dating works out, sometimes it doesn't. You can use your head, follow your heart, or, with one single glance, you might just fall in love at first date. Somehow I can relate at the last paragraph of this novel entitled "Love at First Date (Better Date than Never) " written by Susan Hatler. Not because I fell inlove at first date but because my husband does. He admittedly tell me that our first personal meeting (because we're dating online!) was a bliss that he can't help but continue the relationship we started on web. Neither did I imagine that we will be able to build a relationship through online and still counting. Now back to book! 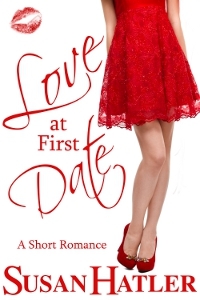 It's the first book in "Better Date than Never" Series, followed by "Truth or Date" and lastly "My Last Blind Date". I purchased this kindle book for $0.00. Yes, it's a kindle edition FREE through Amazon. A 141 pages novel which tackles about a young lady who have been dating guys from a Detailed Dating website, searching for his right guy. Ellen firmly believes that in order to have a long lasting relationship, they have to be compatible and she should know every details of the guy first before jumping into the relationship. But all of a sudden her "match-making" logical being stopped when she met a guy on a local vet whom she can't rid of and even pay for dog classes just to be able to talk with him. Will she be ready to take chances and skip off the safe route and pre-screening guys or will she follow her heart that only beats for Henry? Now, it's for you to find out! If you don't have an amazon account and still wants to read this book, don't hesitate to leave a comment, leave your email or send me a message so I can send you a copy of this book. Just remember it's in a kindle file format. Happy reading!